It's all about the Doomsday in GTA Online this week, but don't panic - that just means you can expect tons of doubled GTA$ and RP rewards. This week's update revolves around Contact Missions and The Doomsday Heist finale first introduced in the Doomsday Heist update from way back in 2017. Now through April 24, you'll get twice the GTA$ and RP on all Contact Missions from Gerald, Lamar, Ron, Trevor, Lester, Martin or Simeon, as well as the jetpack-flying conclusion to The Doomsday Scenario. 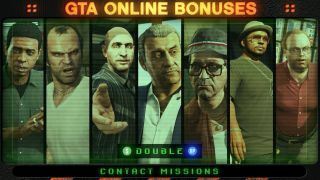 If you're not interested in repeating missions you've already done, no worries - doubled GTA$ and RP is also being offered in three Adversary Modes that call back to previous updates. You can jump into the zone-control skirmish of Occupy, protect your VIP teammate in Hardest Target, or rev up a minigun in Juggernaut to score bonus rewards. You should also go grab a Biker Clubhouse ASAP if you don't already have one, as Rockstar is giving owners a GTA$250k gift from April 25 - May 1. For those in need, you can get Great Chaparral Clubhouse for its lowest price ever at GTA$50k (75% off). Additionally, the Grand Senora Desert Counterfeit Cash Factory is only GTA$100k (89% off) through April 24. If you're short on funds, here's how to make money fast in GTA Online.